The advent of the 1960s brought the Spanish Libertarian Movement some brief respite. The long 1950s, when the organization in exile, as well as the organization in the interior, had seen how their respective approaches to putting paid to Franco had resulted in resounding failure, were now behind it. The former had gambled on armed struggle through the action teams reaching Spain from Toulouse, the capital city of the exiles in France. The latter on a multiplicity of attempts at accommodation with a motley crew of fellow travellers ranging from communists through socialists and republicans to monarchists. Despite the best efforts of the entire anti-Francoist opposition, the dictator remained in power. The international situation, which it was initially felt was about to play a crucial part against the regime, had, thanks to the Cold War, ensured its consolidation. Spanish anti-Francoist fighters watched in disbelief as every international organization, one after another, admitted a regime that, not so long ago, had been labelled fascist. But the opening of the 1960s was, many libertarians felt, time for their movement to be resurrected. After sixteen long years of schism, the two CNT factions in exile were getting back together. It was not so much a marriage as a take-over. The possibilist faction had to agree to each and every one of the conditions imposed by the orthodox faction before unity became feasible. The 1961 Limoges Congress set the seal on the reunification of the CNT in exile. Together with this important move, the organization sought to make up for time lost during the preceding bleak decade and it made way for two initiatives that were about to mark its final years in exile. On the one hand, the Alianza Sindical was launched, in conjunction with the UGT and the STV. On the other, approval was given to establish Defensa Interior, a body that intended to breathe new life into the armed struggle against Franco’s dictatorship. Two approaches indicative of a measure of confusion as to the line that the anarcho-syndicalist organization was supposed to espouse. Whereas the two union groupings with which it was partnered in the Alianza Sindical were members of the recently launched Union of Democratic Forces, an organization lobbying for a transition from dictatorship to democracy through peaceful action, the creation of the action agency pointed to a completely different path to that transition. Albeit that this was not the only muddled situation with which the CNT organization had to grapple. The future of Defensa Interior was about to highlight how the special circumstances surrounding its creation would irretrievably impact on its evolution. Those circumstances – first and foremost the movement’s reunification – obscured a clear view of the genuine intentions of the different groups existing within the CNT. It could be said that only among the younger generation of libertarian youth was there any real appetite for re-launching the armed struggle. Finally, there is one truly telling issue that needs pointing out; more than twenty years on from the end of the civil war, the Libertarian Movement was significantly different from the rest of the anti-Francoist organizations. Whereas these latter had long since given up on the idea of removing Franco by force, the libertarian organization, through its creation of Defensa Interior, was reverting to the use of arms against the dictatorship. The various libertarian organizations – the CNT, the FAI and the FIJL – were thereby reclaiming part of their political culture. It was the last time that the libertarians, through their organization, put together the requisite structures and funding for the action groups. Some of them had lost their lives in clashes with the Francoist police, as was the case with José Sabaté, Luciano Alpuente ‘Madurga’, Julio Rodríguez ‘el Cubano’, Juan Serrano, José Luis Barrao, Francisco Martínez ‘Paco’ and Arquímedes Serrano. Indeed, in 1951, in its yearly bulletin, the Spanish police reported that the action groups had been “utterly annihilated”. Plainly, the libertarian organization had suffered an ongoing haemorrhage of its younger militants and that fact had prompted the orthodox leadership to change tack. The issue surfaced at the orthodox faction’s plenum held in Toulouse in 1951. The CNT acknowledged the extraordinary loss of militants and that the goals set for them had not been achieved and, for the time being, it endorsed the cessation of the armed struggle against the dictatorship. Even though the 1950s were the toughest of times for the organizations opposing Franco, the fact is that within Libertarian Movement locals in exile there was significant effort under way to recover the past. By the end of that decade, those efforts were to have telling consequences for the organization. Prominent CNT members were organizing meetings with younger libertarians who were, in many cases, the offspring of exiled comrades and at those meetings actions that had earned the anarcho-syndicalist organization huge prestige among the workers were rehearsed. Glorious deeds in which the practice of direct action had been the main gambit in the fight against the employers or the State. These orthodox militants were reviving a significant part of anarchism’s “memory”, wherein violence was part and parcel of the political culture. Militants like Felipe Alaiz in Paris, Vicente Galindo in Lyon or José Peirats in Toulouse were teaching younger militants about the most important actions mounted by the CNT in much of its past “from an orthodox viewpoint”. This situation was replicated in Mexico where a veteran like García Oliver, then living in Guadalajara, was working alongside a group of young libertarians that included Octavio Alberola, the son of another militant (José Alberola) or Floreal Rojas (the son of ‘Tierra y Libertad’ group member Domingo Rojas). Octavio Alberola, a key figure in the launch of Defensa Interior, had a significant record of working in youth organizations in the New World. Alberola had had a hand in the setting up of the Libertarian Youth in Mexico and had also belonged to the Anti-Dictatorship Youth Front, as well as various groups established at around this time on Mexican soil, groups like the ‘26 July Movement’, the ‘Revolutionary Student Directory’, in the mid-1950s and, towards the end of the decade, the ‘Movimiento Español 59’. The latter was made up of the children of Spanish exiles drawn from a broad political spectrum ranging from republicans to anarchists and including communists. According to Octavio Alberola, the group of youngsters surrounding García Oliver had a two-pronged goal. On the one hand, to bring about CNT unity and, on the other, “to re-launch the violent struggle against Francoism”. In this regard, the basic notion driving these militants was to transplant to Spain the insurrectionist trend at work in various parts of the Americas, one that had known extraordinary success in the victory of Castro’s guerrilla war against the Batista dictatorship. These sons of veteran CNT militants were joined by young emigrant workers who had left Spain in pursuit of better opportunities. The help afforded by the exiled organizations to Spanish emigrants in their locals or the contacts struck up in scattered locations like “cafes”, created ideal opportunities for political recruitment and libertarian militants did not miss out of these. There, young men such as Francisco Granado, Inocencio Martínez, Manuel Borreo or José Calvo were recruited in the early 1960s for service in the Libertarian Youth and, some of them, later on, for the action groups. The drive from this new generation of libertarian militants had already been making itself felt in CNT organizational activities in the late 1950s. Indeed, at the plenum the organization held in Vierzon in 1959, the pressure coming from the youngsters had pushed through a “Secret Resolution” giving backing to Quico Sabaté’s group travelling down to Spain and carrying on with its armed activity against the dictatorship. Bear in mind that Sabaté had clashed with the leadership of the orthodox organization over the do-nothing-ism (inmovilismo) that, according to him, held the leaders in thrall. Sabaté’s criticisms of the orthodox leaders focused on issues such as the lack of an organizational presence within Spain – and mainly in Catalonia, which had been anarcho-syndicalism’s stronghold within the country, but where it had by then all but petered out – and on the deceit in the information that those leaders were supplying to the membership in exile and, above all, on the abandonment of armed struggle. That resolution struck a real chill into the orthodox leaders. Because, even though those ageing militants had carried on backing the armed approach throughout all the years in exile as the best way of fighting the dictatorship, the fact is that, in the wake of the 1951 resolution, such advocacy had been more ‘playing to the gallery’ than effective. Added to which the Spanish exiles’ circumstances in France were going through one of their more complicated phases, given the close relations existing at the time between the governments in France and in Spain. In fact, the French government had banned a range of meetings to mark the July 1936 revolution, had forced the CNT to hold its most recent plenum in the French city of Vierzon – whereas the CNT wanted it held in Toulouse – and, furthermore, the CNT press was forever being issued with cautions and threats of shut-down by the French authorities. All of which led the orthodox leaders to think that a resumption of armed action in Spain might trigger the outlawing of the CNT on French soil. After twenty years in exile and with their lives made over, the CNT leaders looked on, concerned, at the new situation created by the Vierzon resolution, and so the Toulouse Local Federation drafted a motion to have the organization review the “Secret Resolution” pushed through by the Libertarian Youth. Sabaté’s death, however and the killing of his group in Spain in January 1960 following a clash with Francoist forces, delayed the debate on that motion inside the organization, but not the new generation of libertarians’ appetite for the struggle. The 1961 reunification of the Libertarian Movement was key to the establishment of the new agency of armed struggle. The 1961 Limoges Congress set the seal on the reunification which had been achieved, dating back to the year before, in the various Local Federations across France. The special circumstances libertarians faced in the light of this ralliement paved the way for the activation of Defensa Interior. Indeed, the actions carried out by the two opposing factions – the orthodoxes and the possibilists – over the preceding years had not suggested a reversion to armed struggle. As far as the former were concerned, because the orthodoxes had, as we have seen, abandoned such operations against the Franco dictatorship as far back as the early 1950s. Their activities were confined to occasionally pointing out in its propaganda or at plenums held throughout that decade, that the only way of unseating Franco was insurrectionist action. But such claims were never anything more than theoretical and, what is more, when the young libertarians secured a commitment from the organization at the Vierzon plenum that the armed struggle would be set in motion, the leadership’s response was, as we have seen, wholly and solely directed into stymying any such implementation. Meaning that neither faction gave any hint of a reversion to the armed approach to combating the dictatorship. However, the reunification of the CNT changed that situation entirely. The orthodoxes had come out as the real winners from the unity negotiations and insisted of the other faction, as a pre-requisite, that it embrace the classic principles, tactics and goals of the CNT. The implication of which was that the only valid approach to ending the dictatorship was direct action, which at the same time required, implicitly, that the possibilists give up on continuing down the road of political negotiation. Bear in mind that the possibilist faction had not been able to break free of the ad hoc approach that imbued all its actions. It had failed to lay down the ideological groundwork that might have led to the establishment of a brand-new organization with anarcho-syndicalist foundations but better attuned to the realities of the times. Nor had its tactics brought about the desired end. So the idea of reunification led to their entertaining hopes, to say the least, that the CNT might recapture its lost strength. As a result, they embraced the orthodox ideological assumptions, even though they no longer believed in them, and, with the “zeal of the convert”, they endorsed the establishment of the action agency. 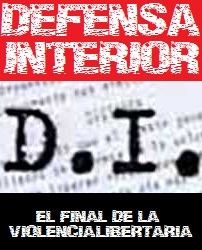 In fact, the 1961 Limoges Congress passed the confidential motion under which Defensa Interior was created. The agency was answerable to the Defence Commission which was made up of the secretaries from all three libertarian organizations – the CNT, the Libertarian Youth and the FAI. Congress gave the go-ahead for its make-up, its schedule of activities or its place of residence to be kept secret. In concert with the Defence Commission, the agency itself was charged with hand-picking the comrades who were to make up the groups assigned to perform the chosen missions. The recommendation was that they train action groups specializing in every aspect of fighting, set up safe houses in exile and within the Interior, set up frameworks for technical, strategic and tactical training, as well as a new and infiltration team particularly suited to university, student, intellectual and worksite circles and the training of an appropriate propaganda set-up, specializing in oral, written and broadcast communications. With those aims – far too grand for the Libertarian Movement’s real circumstances – then, plainly, the contribution expected of the organization would be considerable. The minimum sum required before the brand-new agency could embark upon its activities was reckoned at ten million francs. The new agency was made up of seven militants representing the whole of the libertarian organization scattered around the globe. Vicente Llansola, Germinal Esgleas and Cipriano Mera were the representatives from the organization in France. Juan García Oliver represented the membership in exile in the Americas, Acracio Ruiz represented the organization in Britain, Juan Jimeno that in North Africa and Octavio Alberola was representing the Libertarian Youth. In May 1962, the members of Defensa Interior agreed that armed activities would launch in June that year. That decision set the Libertarian Movement apart from the other anti-Francoist organizations which had long since turned their backs on violence as a means of removing the Franco regime. Ever since the 1940s, the option of peaceful means of restoring democracy in Spain had been gaining momentum in the opposition forces and this became more pronounced as the decade proceeded. We need only recall the establishment and activity of the National Alliance of Democratic Forces (ANFD) back in October 1944, with its emphasis on its democratic and peaceful character. Or the pact signed between socialists and monarchists in St Jean de Luz in August 1948. Or the turnaround in the tactics of the Communist Party which, after an important presence in guerrilla warfare in the dictatorship’s first decade, switched from the late 1940s on, to penetration of the regime’s institutions in order to launch its policy of “national reconciliation” by the mid-1950s, thereby explicitly repudiating the use of violence. This trend towards rejection of violence and the embracing of potentially peaceful political change in Spain was gaining ground as time passed. So, even as the anarcho-syndicalist organization was reverting to the armed approach, the rest of the anti-Francoist forces were arranging pacts, signing alliances and holding meetings at which the peaceful road was embraced as the only possible means of making the transition from dictatorship to democratic rule in Spain. But the first problems Defensa Interior ran into emanated from within the Libertarian Movement itself. In May 1963, two of the main faísta leaders, Germinal Esgleas and Vicente Llansola, had tendered their resignations from the fighting agency on the grounds, they alleged, that there was a cavalier approach and inadequate coordination in the activity of its members. Added to this, there came an episode that created turmoil within the Libertarian Movement – the execution by garrote vil of Libertarian Youth militants Joaquín Delgado and Francisco Granado in August 1963. Delgado and Granado were charged with planting bombs at the General Security Directorate and the premises of the Vertical Syndicates in Madrid. In actual fact, the planting and detonation of the devices had been the handiwork of quite another action group, made up of Sergio Hernández and Antonio Martín who had likewise been sent in by the organization in France. What happened in Madrid highlighted a significant lack of coordination in the preparations for operations, with tragic consequences. The Libertarian Youth organized various meetings in France by way of protest at the execution of their two comrades. In response, the French police carried out the arrests of a goodly number of exiled libertarians between 5 and 11 September. If the executions of Delgado and Granado left libertarian militants stunned, the police round-up in France left the exiles deeply worried as they watched their direst predictions starting to come true as Defensa Interior went into action. Both decisions were hotly contested by the youth organization. The first one because the reckoning was that those who had resigned from the combat agency ought not to have been returned to any position related to armed activity, when Esgleas and Llansola inevitably took on such responsibilities as part of their new posts. Besides, in the latter’s case, the position was further complicated because Llansola had been the man charged with overseeing an attempt on Franco’s life; not only had he plainly failed in the mission entrusted to him, but significant material and funding had been squandered. The youth organization called upon the new coordinating secretary to account for what had happened and to shoulder his responsibilities. As to the lack of funds, the youth demand that funds raised by the CNT for such activities should be handed over in their entirety to the Defence Commission, its view being that such sums should benefit all branches of the libertarian organization included within Defensa Interior, rather than the anarcho-syndicalist organization alone. This confrontation between the orthodox leaders and the youth organization exposed the differences the forces then at work within the Libertarian Movement. Whereas initially this internal competition implied a stymying of armed activity, it would start to plunge the CNT into a crisis from which there would be no way out. In fact, after two years of meetings in the locals the organization had throughout the exile community and the trading of dozens of circulars, the organization summoned all the contending factions to a Congress in Montpellier in 1965. At that conclave, the membership had to pass judgment on the performance of the organization’s main two leaders, Esgleas and Llansola, who stood accused by the members of the Libertarian Youth of having trespassed against resolutions, bringing subversive activities to a standstill and using their positions to shield their performance from scrutiny. Furthermore, Llansola was accused of misappropriation of funds. Congress held a special sitting to clarify the Defensa Interior matter. During those proceedings, the chief accusers – Octavio Alberola and Cipriano Mera – found themselves facing accusations. Esgleas and Llansola were exonerated of all the charges levelled against them, whereas the youth organization’s two representatives were accused of cavalier behaviour and irresponsibility for disclosing the make-up of an agency that ought to have been kept a close secret. In addition, Esgleas charged his former accusers of failing to provide an explanation for the expenditure of a million and a half francs that the organization had handed over to them for the mounting of various operations. In short, Congress found Mera and Alberola had “fallen short of the standard of militant responsibility”, although they were not sanctioned “for the sake of organizational harmony”. In the end, the militants gathered in Montpellier decided to wind up Defensa Interior by rescinding the 1961 resolution and ratifying the 1951 resolution instead. As a result, the organization discontinued with direct action as a strategy within Spain and gambled on boosting the restructuring of the CNT as a trade union in the Interior. At the beginning of the 1960s, the Libertarian Movement had set off on a path that distinguished them from every other anti-Francoist organization. Whereas the main parties and unions that had participated in the civil war had, over recent decades, been gradually retreating from the possibility of changing Spain’s political regime through the use of force, the libertarian organizations set up the Defensa Interior action agency. The main activity of this new agency was to mount violent attacks on Francoist institutions and laying the groundwork for an attempt on the dictator’s life. This situation had come to pass, in part, because older anarchist militants had, throughout the 1950s, striven to recapture a significant part of libertarian political culture. In the CNT’s locals in exile talks and lectures had been held highlighting the glorious past of the anarcho-syndicalist organization and the importance of “direct action” in the achievement of its aims. The main target audience for these efforts was the children of exiled militants plus young emigrants who had had to leave Spain in search of better prospects. Some of them ended up becoming members of the Libertarian Youth and manning the action groups which, as in the past, tried to enact the use of violence against the Francoist dictatorship. The structures and resources upon which the new armed agency was to rely were approved at the Congress the libertarians held in Limoges in October 1961. Eight months on from that, the libertarian action groups’ armed operations began in the main cities in Spain. At the same time, the vast majority of the domestic and exiled anti-Francoist organizations held a gathering in Munich at which they explicitly abjured the use of violence in securing political change in Spain. However, the new libertarian agency’s armed operations lasted only a year. When it comes to analysing the reasons why Defensa Interior was wound up, we need to take account of two different realities. On the one hand, repetition of actions that had already led to armed activity’s being abandoned back in the 1950s and which were replicated ten years later. Specifically, the loss of the lives of young militants, shortage of funding and an organization whose planning and pursuit of armed operations left something to be desired. On the other hand, we need to bear in mind the circumstances surrounding the reunification of the Libertarian Movement in 1961, which had been crucial to the endorsement of Defensa Interior. First, there was the embracing of the armed struggle as a tactic to be deployed against the dictatorship both by possibilists and orthodoxes when, in fact, both factions had abandoned recourse to violent activity – the former at the beginning of the period in exile, the latter on the basis of previous experience. Those circumstances were a factor in showing up the rabble-rousing aspect of their stance. After twenty years spent in exile, neither faction was ready to jeopardise the stability of their status in France for the sake of a “solution” in which nobody actually believed. The youth organization was alone in reckoning that armed action might bring about the end of the dictatorship. Younger libertarians seized upon the circumstance of the reunification to press ahead with “their” combat organization and they felt let down when the rest of the Libertarian Movement chose to wind up Defensa Interior at the Montpellier Congress in 1965. One group carried on mounting forceful operations against the dictatorship, but they did so through other newly created bodies [the First of May Group, etc.] and without relying upon the organizational backing of the Libertarian Movement. That really spelt the end of the gamble (involving the whole of the libertarian organization) on violence as a means of ending the Franco dictatorship. Regardless of how often, over the ensuing years — and right up until the dictator’s demise — the CNT unwaveringly championed direct action as the only means of fighting the dictatorship. Interview with Luis Andrés Edo in Barcelona on 26 July 2001. See PONS PRADES, Eduardo Guerrillas españolas: 1936-1960, Barcelona, Planeta, 1977; and TÉLLEZ, Antonio, Sabaté. Guerrilla … op.cit. The possibilist CNT in exile was the sponsor both of the Alianza Sindical and the Unión de Fuerzas Democráticas set up in France at the beginning of the 1960s. See HERRERÍN, Ángel La CNT durante … op.cit. See TUSELL, Javier La oposición democrática … op.cit., pp. 389-420. Meeting of the Defence Commission on 14 December 1963, included in the Youth Organization in England’s report on the DI. AFSS, Madrid, no classification. Letter from the Youth Organization to the Defence Commission, dated 3 December 1963, as included in the report from the Youth Organization in England on the Defensa Interior issue. AFSS, Madrid, no classification.